Dr. Thynn Thynn is a Burmese born retired physician and Dhamma teacher. She is mother of two and is the resident yogi at the Sae Taw Win II Dhamma Center in Northern California. She is the lineage holder of the Shwe Baw Gyun Burmese Buddhist tradition and teaches Classical Buddhism and Vipassana (Insight Meditation) for daily life. Another focus of her teaching is to integrate Abhidhamma Teachings (Buddhist Psychology) into Daily Life Mindfulness Practice. 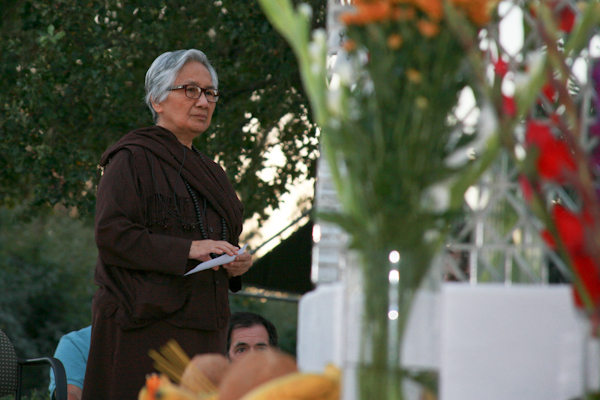 In 1978 she published a book in Burmese about her experiences in Buddhist meditation. Her most popular and significant work: Living Meditation, Living Insight is in English and has been translated into Dutch, German and Vietnamese. In 2005 Dr Thynn received the Outstanding Women in Buddhism Award – that celebrates the acts of courage and determination by women in the history of Buddhism.